You can save time and money by considering water inflated cofferdams in lieu of sand bags on your future dewatering projects. 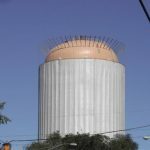 Many General contractors are successfully utilizing Detroit Tarp Water Inflated Cofferdams around the world. Creating a sandbag wall can take thousands of sandbags to construct, not only does this take a lot of time but another factor is the back breaking labor intensive strain it puts on the body. Working in or around water is a challenge in itself but it has to be done, trying to construct a wall with sand bags underwater is precarious and can lead to major leaks in the configuration. bringing foreign fill material can become an issue with environmental agencies and requires high disposal expenses. 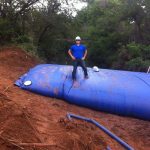 Detroit Tarp Water Inflated Cofferdams require an easy installation process by utilizing hydraulic equipment and gas powered water pumps. As the pumps flow the water does all the work. During the installation process the water inflated cofferdam forms a seal to help prevent water seepage on uneven surfaces from jeopardizing the work site. Using on site water will help reduce cost and negative environmental impact. Detroit Tarp Cofferdams are constructed from a woven polyester reinforced vinyl, weighing in at 30 oz PSY. This fabric is mildew, mold and UV resistant to increase reliability and readability during strenuous and long term use. We use four inch fill/drain ports made exclusively out of ABS plastics locally manufactured for our cofferdams. We use ABS instead of PVC plastic due to its increase strength and durability impact residence allowing for increased pump pressure thus increasing daily productivity.